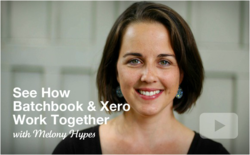 See how Batchbook and Xero work well together at http://batchbook.com/integrations/xero.html. Armed with personal and financial information at their fingertips, professionals who utilize both Xero and Batchbook can interact more personally with their customers and suppliers and make more informed and timely business-critical decisions. Cloud-based software dynamos Batchbook and Xero recently established a product integration to help growing businesses champion deeper relationships with customers, vendors and other contacts. Users now can connect data from the global leader in online accounting software with their social CRM for true clarity into the personal nuances that live in their contact database – insight that helps businesses increase revenue. ● Enlightened marketing and finance teams! A high level view, without exposing sensitive data, translates to less time searching for facts or figures and more time building relationships with the right people that will grow a business. ● Happier customers! Tracking ongoing emails, phone calls, meetings and social media interactions offers a historical view to encourage more personalized invoicing and marketing. ● More paying customers sticking around! A specialized search function allows users to identify inactive customers, to reach out and to keep them from falling through the cracks. Learn how to set up the integration and more at http://batchbook.com/integrations/xero.html. Batchbook, http://batchbook.com, is a software company based in Providence, RI, founded in 2006. Their social CRM software is designed for small businesses and organizations. Batchbook provides an affordable, cloud-accessible solution that is easy to adopt as an individual or a team. Its feature set includes full contact details management, social integration, to-do list, advanced searching, list building and reporting. Batchbook takes a unique approach to contact management, encouraging users to maintain smaller lists, make more personal contact, and to build a culture of openness and teamwork. Xero is beautiful, easy to use online accounting software for small businesses and their advisors. The company has over 100,000 paying customers and 240,000 users in more than 100 countries around the world. Xero’s U.S. team is based in San Francisco. For more information, see http://xero.com. Batchbook is a social CRM which helps you build meaningful relationships with your best customers. Xero is beautiful, easy to use online accounting software for small businesses and their advisors.